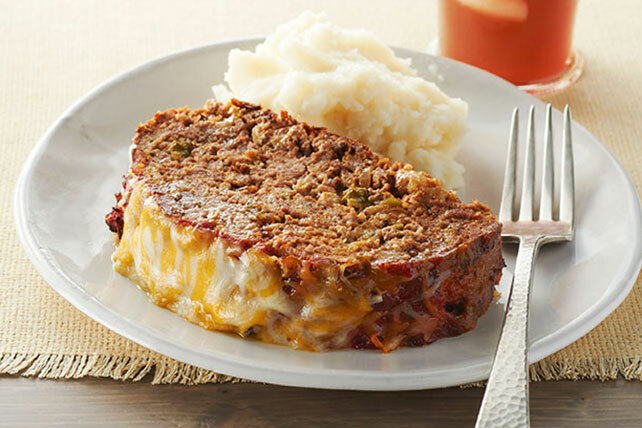 Party on with a delicious Fiesta Meatloaf recipe that yields eight servings. This is not just any old meatloaf; t's a south-of-the-border Fiesta Meatloaf! Mix all ingredients except 1/4 cup salsa and cheese. Shape into oval loaf in 13x9-inch baking dish; top with remaining salsa. Bake 1 hour or until done (160ºF). Top with cheese; bake 5 min. or until melted. Serve this comfort food with hot mashed potatoes and steamed broccoli. Increase salsa to 1-1/4 cups. Mix meat mixture as directed; shape into 48 meatballs. Cook, in batches, in large skillet on medium heat 12 min. or until evenly browned and done (160°F), turning frequently. Spoon onto platter; top with remaining salsa and cheese. Mix meat mixture as directed; shape into 8 patties. Grill, broil or pan fry until done (160°F), topping with remaining salsa and cheese for the last 2 min.